1. To show the mouth chart letters, if they are not already present in the Xsheet view,right-click on the sound column and select Lip-Sync > Sound Display > Mouth Shapes from the pop-up menu. 2. In the Xsheet view or Timeline view, right-click on the sound layer's cells and select Lip-Sync > Auto Lip-Sync Detection. You can also select Animation > Lip-Sync > Auto Lip-Sync Detection from the top menu. Harmony analyzes the selected sound clips and assigns a lip-sync letter to each frame. The X markers in the frame are replaced by these designated letters. 2. In Sound Element panel, select the waveform you want to generate the mouth chart for. 3. 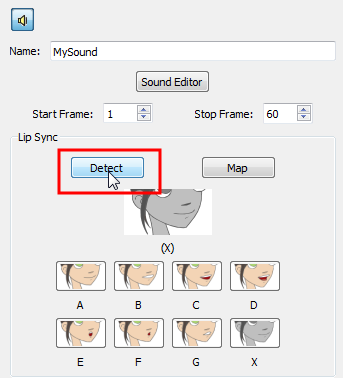 Right-click on the sound file and select Auto Lip-Sync Detection. 1. In the Timeline or Xsheet view, select your sound layer. 2. 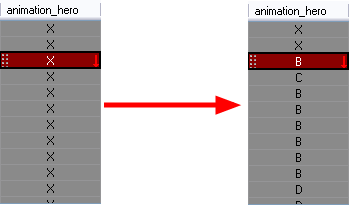 In the Layer Properties, click Detect.